After almost a week in the wilds of Big Bend Ranch State Park, then over to Big Bend National Park, I found myself exploring an area of Texas I didn’t know quite as well – Brownsville, Texas. I’d walked the sands of South Padre Island and driven the Queen Isabella Causeway in the past, but I’ve not photographed the resacas (waterways) in this border town. I had the opportunity to basically be guided around the area by a local, and jumped at the chance. My friend – I’ll call him Mark for now – is a photographer, as well, and better than he gives himself credit. We met in San Antonio just after lunch and made the drive to Brownsville. Mark had written down 25 potential locations for me to shoot, locations in Brownsville, Port Isabel, and South Padre Island. He’d made arrangements for us to stay in Brownsville, so that first night we focused on a few scenic resacas. Before the trip, I had never heard the word resaca. Now I know these waterways are remnants of the Rio Grande River flow. Ten percent of Brownsville is taken by these waterways, and with the sun low in the horizon followed by a setting crescent moon, the evening offered some nice photographic opportunities. A crescent moon sets in the west over a resaca in Brownsville, Texas. These waterways are found throughout this border town and add beauty to the city. 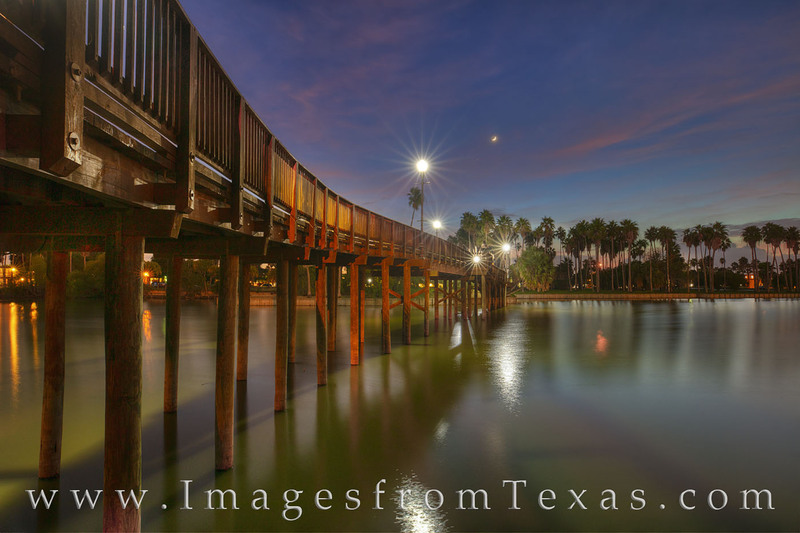 This footbridge crosses the water on the campus of Texas Southmost College. That first night, I noticed traffic seemed a little haphazard. In some ways, it reminded me of my younger days when commuting in Rome. I once had been driven around the eternal city by a monsignor at the Vatican (he was an American serving there). I asked him what was his secret to managing the driving madness. His answer: Don’t make eye contact! He said if your eyes met the eyes of another driver, that gave him permission to cut you off. I asked if he’d ever been in any wrecks. His answer, grinning: Sure, everyone who drives here has. Brownsville wasn’t that bad. As we weaved in and out of traffic on a Thursday night in Brownsville, I asked Mark if it was always so crazy driving here. Smiling, he said: It’s Brownsville. I’m glad to say we never had any fender-benders, but driving was a bit sketchy at times. We awoke on Saturday morning well before dark. Our destination this a.m. was past Port Isabel and over the bay (Laguna Madre) to the sand dunes of South Padre Island. We had planned on driving down Ocean Blvd until we found some nice dunes, but high water prevented us from traveling more than a few miles before the road was too much under water for us to continue. I had no idea that a hurricane 600 miles away could affect the water levels on the beach. But it had. So we parked, scampered up and over the sand to the east, then dropped down the other side and headed toward the ocean. From there, on a windy October morning, we both enjoyed a beautiful sunrise. The beach was filled with shells and parts of shells. When the water would recede between waves, the shells would leave zig-zagged and curving lines in the sand. With the sun’s glow on the sand, I really liked the lines in the beach. From South Padre Island, this is a beautiful early morning sunrise. As the waves washed out to the Gulf waters, the lines in the sand created by shells tumbling in the shifting surf weave a tapestry in the orange light of morning. Overhead, three gulls watched my work from overhead. We played here, photographing every angle we could manage, then headed to the other side of the island to photograph any fowl we might find. After that, a trip over the causeway to Port Isabel allowed us a brief stop to photograph the Lighthouse in the center of town. After that, I was guided to an amazing Mexican restaurant, but not before shooting the courthouse of Cameron County. After a midday siesta, Mark took me back to the island,but this time we were shopping for stuffed dolphins. Yes, being away from my family sometimes requires me to bring my girls a gift as pennance for being gone. And they love dolphins. After stopping at several tacky tourists shops, I finally found a pink and a blue dolphin – perfect for a peace offering. From the tacky tourist are, we shot several locations – birds on a stump in the water at sunset using a 400mm prime lens, the east side of the Queen Isabella Causeway, and the west side of the Causeway. 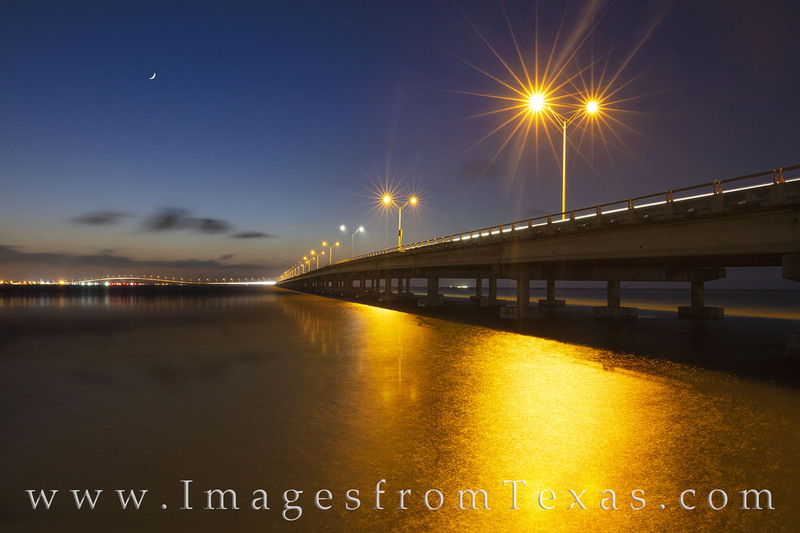 The Queen Isabella Causeway stretches 2.37 miles from Port Isabel to South Padre Island. It spans the Laguna Madre and is the onlyl road connecting the south Texas mainland with the island. 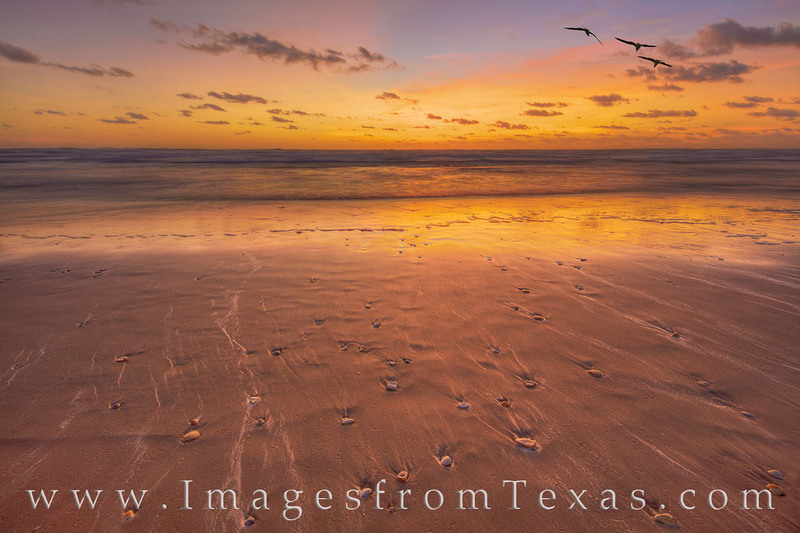 This image was taken from the South Padre Island as a crescent moon was setting in the west. 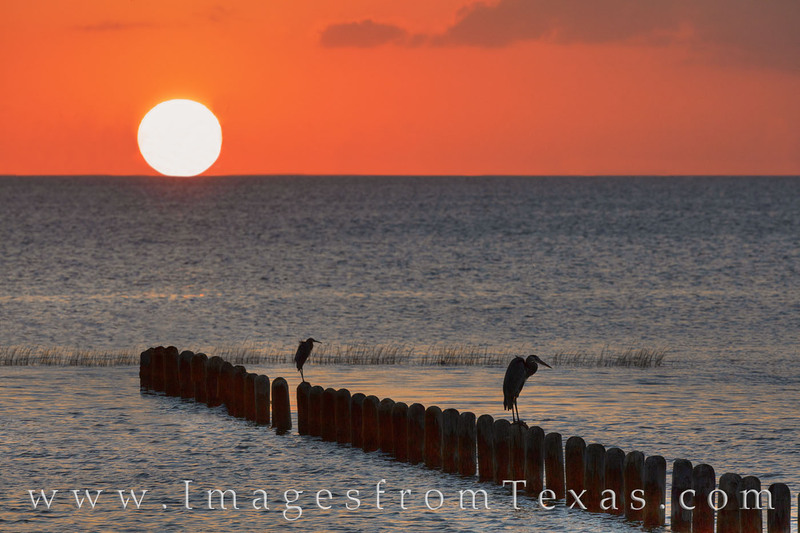 On a humid October evening on South Padre Island just north of Port Isabel, the sun last light spreads across the water between the Island and the mainland. In the foreground, an egret searches for fish who may swim his way. We tried to photograph some shrimp boats, but in asking for permission from (apparently) the crew, the gnarly guys working did not speak English. I tried talking slower and louder and using hand gestures, but one fellow just took a drag from his one-inch cigarette, turned, and walked away. The other said, I think, we needed to talk to the boss. When asked where the boss was, he shrugged and sat back down to do whatever was doing before being interrupted. That night, after a long, hot, and humid day, Mark took me to a street taco dive. Both outside and in, the area was teeming with Hispanic folks enjoying the evening. I am 100% sure we were the only gringos in the place. And the street tacos – bisteak and barbacoa with avocado and goat cheese were amazing. I tried the sauces, too. The orange sauce, whatever that was, left the right side of my face numb – as if I’d been to see the dentist. Some might ask if I was a true Texan. The answer is yes – 4th generation! And that stuff was numbingly hot. The left side of my face will remember how good those tacos tasted. The right side remembers nothing. A little more time in Brownsville shooting around Texas Southmost College and the resacas made it a successful, fun, and enlightening trip. I had some great food, donated some blood to the local mosquitoes around the water, and enjoyed exploring a new location. – It is a long drive from the Hill Country to the Texas/Mexico border. Posted in and Gulf locations and tagged beach, border town, brownsville, isabella causeway, lighthouse, port isabel, resaca, sand, south padre island, south texas, sunrise, sunset on October 17, 2018 November 12, 2018 by Rob Greebon.